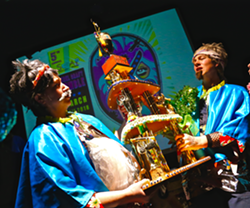 Four teams will compete in a battle of high pressure creative problem solving and artistic wit to become the next Extreme Ultimate Supreme Craft Masters in SCRAP Humboldt’s sixth's annual Rebel Craft Rumble on Saturday, March 30th at the Arcata Playhouse, 1251 9th street. Doors open at 6:30 p.m. with a Happy Hour! Rebel Craft Rumble is a live action creative competition inspired by TV shows like Iron Chef and Making It. This event sells out so grab your tickets early. The challenges will be titillating, the pressure will be palpable and the fun will only happen once a year!